Wayne Rooney can score 70 England goals and his international record will last for “at least a decade”, says former striker Gary Lineker. The 29-year-old forward netted his 50th goal in Tuesday’s 2-0 win over Switzerland to move clear of Sir Bobby Charlton’s total of 49 England goals. “It’s going to be a long time before anyone gets close to Wayne,” ex-England captain Lineker told BBC Radio 5 live. Is Rooney England’s greatest striker? Lineker, a former Leicester, Everton and Tottenham player, said he considered himself more of a “natural goalscorer” than Rooney, but added: “You have to play for a long time to score that many goals so his record will be there for at least a decade. “It’s a wonderful achievement for Wayne and he has been pretty consistent in terms of goalscoring since he burst on the scene in spectacular fashion. Asked to compare Rooney with previous England strikers, Lineker said: “Different players, whatever era, have different strengths. “Wayne is quite creative and has a better all-round game than me. 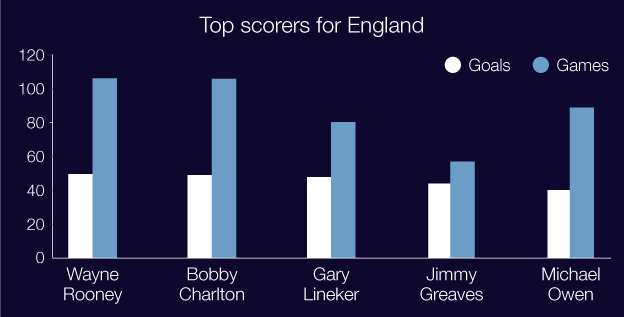 England’s leading scorers. Wayne Rooney has 50 in 107 caps; Sir Bobby Charlton scored 49 in 106; Gary Lineker scored 48 goals in 80 games; Jimmy Greaves scored 44 in 57; Michael Owen hit 40 in 89. Despite scoring more goals than any other England player, Rooney says he constantly worries about being dropped from the side. “There are a lot of young lads in this team and I don’t want to give my place up,” said the Manchester United captain. “I train every day as if my place is on the line and I have always done that throughout my career. England boss Roy Hodgson believes Manchester United left-back Luke Shaw can go on to have a career like Ashley Cole, who won 107 caps. Shaw, who has made six international appearances and never been on a losing England side, struggled for fitness last season following a £27m move from Southampton to Old Trafford in June 2014. “I would advise Luke to study Ashley, look at what he did for England and set his sights on the same thing,” said Hodgson. “He’s still only 20 and if he keeps going then he’s on track to be another Ashley Cole. Hodgson has been impressed by the character shown by his young players as the side recorded eight successive wins to become the first team to qualify for Euro 2016. “We’ve certainly found a stronger group, there’s no doubt about that – I think we’ve probably been quite brave,” said Hodgson. “We played Jonjo Shelvey and Ross Barkley for 90 minutes in the team together and it’s a fairly brave move to do those kind of things. It puts them under enormous pressure, but I think they’ll learn from it.